First, PLEASE dont post in here how you have scoring on your rotors after x miles, any stories related to that, grinding noises etc. There is already PLENTY of threads for that. Front pads GM part number - ? R1 SLOTTED rear rotors! $185/pair - r1concepts.com [email protected] - currently not listed on their page but if you call or email they can get em to you! 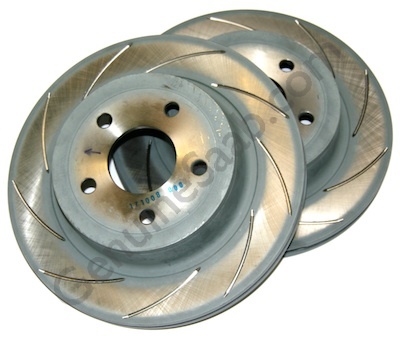 The rear rotors for a 2003 saab 9-3 DO NOT FIT. The measurements are the same, and they use the same pads, but they do not work. *Note! RockAuto.com at the time of this post does NOT have the right parts listed for the 2008+ SS. Neither does most web pages when you look for the rear (or front) rotors. Front - 315.5mm x 26mm rotors, 38mm 4 piston Brembo aluminum calipers. The calipers ARE different than the Sport! Rear pads from a Solstice work, GM part number - ? - I ran these on my car until I got the hawk pads above. If you have information to add (again, please confirmed only) post it here and I will edit this post to reflect it. Last edited by IsItFast? ; 02-13-2010 at 01:32 AM. If those are in fact the correct rear pad part numbers for Autozone (I'm sure they are), Advance Auto Parts carries PD1033 pads (usually next day delivery) for under $50 on their website. NAD1033 are the cheaper versions. GM Part Number 15921402 (rear rotors): Back Ordered (Part is on national backorder with GM, GM does not currently have an ETA for the part to be released. So for those of us needing rotors that means there are NONE available unless your local dealer happens to have some in stock. awwwwww, well what about the Saab 9-3 rotors? Last edited by IsItFast? ; 09-18-2009 at 11:50 AM. The PNs I recieved from a dealer for the rotors and rear pads correspond to the numbers listed, so I'd say that is a current PN. doesnt r1 concepts make ss/tc rotors? Just a FYI. If you order ANYTHING from GM PartsDirect CALL FIRST and let THEM look up the part number. If you use THEIR on line catalog and order the part acording to THEIR listing and you get the wrong part, even if it is the right number from the on line catalog, you own it. Their are NO returns and definitlely no refunds. READ THE CONDITIONS OF SALE ON THE SITE. Their not kidding. I don't see how they can post a catalog with part numbers according to applications, sell you that part number and not take it back if THEIR catalog is wrong. I, personally, wouldn't order anything from them again even if meant I would have to walk. In a previous life I was the parts manager for a Pontiac agency so I DO know how to use a parts book. I am just wondering who sells really good high performance pads, and some slotted/drilled rotors for these cars... I would like to purchase some in the near future. Their are NO returns and definitlely no refunds. READ THE CONDITIONS OF SALE ON THE SITE. Their not kidding. I don't see how they can post a catalog with part numbers according to applications, sell you that part number and not take it back if THEIR catalog is wrong. I, personally, wouldn't order anything from them again even if meant I would have to walk. Yeah, adding my 2 cents about all the parts sources above: it does NOT mean I am recommending them - just that is where I have found parts so far. As a matter of fact gmpartsdirect sent me an email shortly after my order telling me about the backorder. In it they stated reply that you want to cancel or wait. I replied with a cancel request. 7 days later I was delivered TWO sets of rotors.. So not very impressed with them. However they are still the cheapest source as of now. Read the original post, toward the bottom. Hawk has an entire line of performance pads, and genuinesaab.com carries machined (slotted) stock rotors, front and rear. I cant vouch for this company, but they do carry a (currently) unique part. IsItFast do the Saab rotors work because I can no longer drive my car? Last edited by IsItFast? ; 09-18-2009 at 11:52 AM. I still can't say for sure unfortunately. The part I received from the eBay dealer were the front rotors for a BMW 5 series(his mistake still trying to get it corrected).. I do have an extra set of rear rotors from gmpartsdirect, but it would probably cost me as much to ship as buying them directly. I hear you about not driving the car, i've been driving my 9mpg f250 while I wait on the rear brake pads from the hawk hps group buy. The mesurements I posted are the same for the Saab as our cars, so they should work, but I can't say for sure. If you get a pair and they work please update this thread. I have a parts guy from GM acquiring them for me but I have Hawk pads already. What model and year saab? 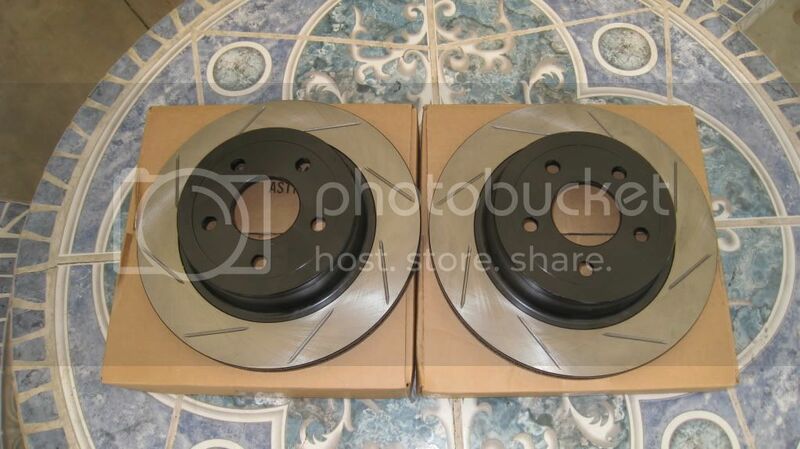 I ordered the Saab 9-3 rear rotors. I'll find out if they fit when I get them. They're coming from CA to MD so it may be 2-5 days until I know. Just got a PM from NGA Motorsports and they did send me the right pads. Saab rotors bolt up but DO NOT FIT our cars. I received some extra pads with the rotors so I put them on the horrible stock rotors until I can find a stock replacement. Ok, thanks for that information - sorry you had to be the one to find that out but you probably just saved quite a few people from doing the same. Which Saab did you order the rotors for?